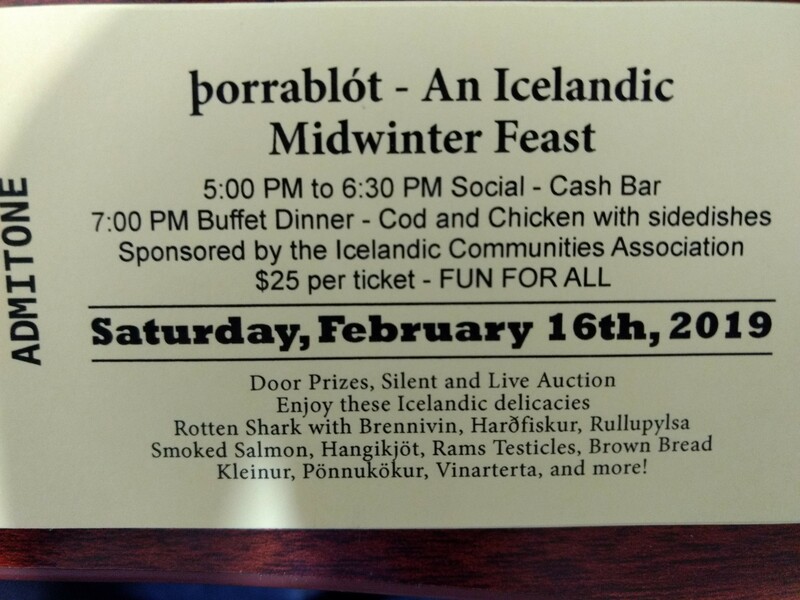 2019 Date for the Þorrablót is FEB 16th! Icelandic Feasts and Holidays, Celebrations, Past and Present by Árni Björnsson published in 1980 by Iceland Review History Series. The famous feast, Thorrablot (Þorrablót), takes place during this month called Thorri (Þorri). The very first day of the month is Bóndadagur. The following are excerpts from pages 14 – 17 of this book. It is an age-old custom to celebrate the first day of Thorri. Jón Árnason’s Icelandic Folk and Fairy Tales describe it as the duty of the farmer to welcome Thorri by rising earlier than anyone else. He was to get up and go out clad only in a shirt, barefoot and partly barelegged, for he was to wear only one leg of his underpants, while the other was to be dragged behind. Thus attired, he was to . . . hop on one foot all around the house, dragging his underpants on the other, and bid Thorri welcome to his home. The first day is still called “husband’s day” and on this day the lady of the house is supposed to treat her husband exceptionally well. In a 1728 letter, the Rev. Jón Halldorson writes that he does not know whether welcoming Thorri is an old custom or a newfangled idea of the common people. He states that he has no knowledge of sensible people participating in such frivolous customs and claims to be actually ashamed to put such nonsense to paper for distinguished people to read. He says, that wintertime and weather in Iceland often depresses people severely and inviting Thorri … so that it might be mild and harmless to her and hers. These traditions were to befriend the spirits and bring good luck to the farm and home. In the late 14th century, the Flatey Book tells of old King Thorri, who made a sacrifice called a Thorrablot every year in the middle of winter. His daughter was named Goa (the name of the next month) and other royals mentioned were Aegir (Sea), Logi (Fire), Kari (Wind), Frosti (Frost), and Snaer (Snow). So, it seems that Thorri was some kind of winter spirit or weather god. The word Thorrablot indicates that such ceremonies were customary at the time. These heathen ceremonies were prohibited when Christianity was adopted. 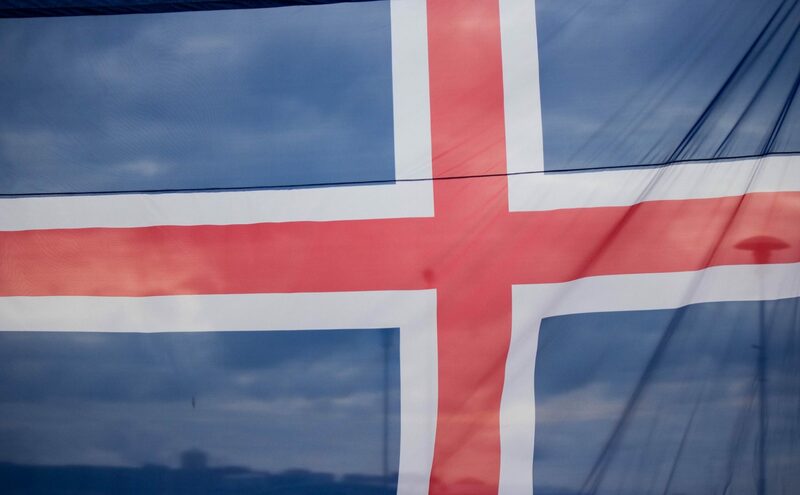 In the 1870s, when Iceland was struggling for independence, the idea seems to have been rekindled of making Thorrablot “according to ancient custom.” In Akureyri, they have had a Thorrablot celebration every year since 1874 (the 1000th anniversary of the settlement of Iceland). I wonder if my ancestors that lived near Akureyri attended a Þorrablót in the years 1874 until they left for America in 1882 and 1883. Apparently, they even decorated the locale according to the prevalent ideas about ancient customs. Toasts were made and drunk to the old gods and goddesses as well as to the mother country and to prominent citizens. Mostly, Thor, the thundergod was honored, probably because it was a popular explanation that the name Thorri was for Thor. 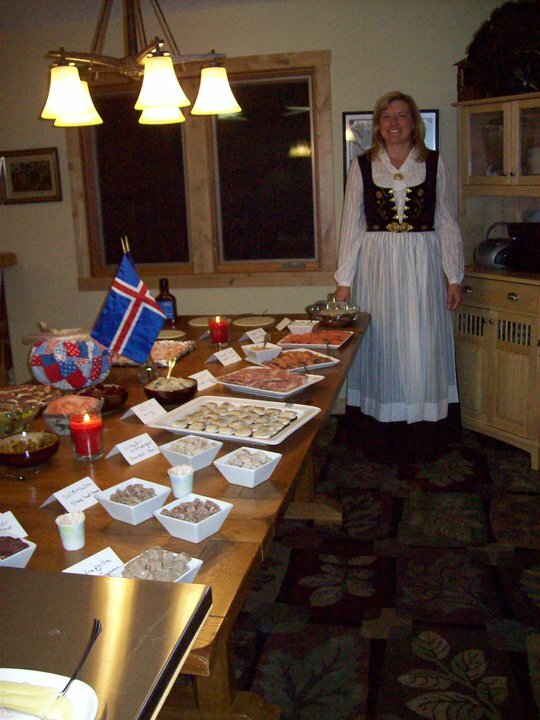 The food served at a Thorrablot is of traditional Icelandic dishes, prepared the way people did in earlier times, when necessity demanded total utilization of their livestock and there was no modern ways of preservation. The principal kinds of Thorrafood are: Hangiket (hung smoked lamb meat); whale (fibrous, fatty tissue from the underside of the animal pickled in sour whey); shark ( ripened by burial for a certain length of time to make it decompose the correct way and rid it of ammonium); svid, (singed sheeps’ heads and legs sawed in two, cooked, and eaten fresh or soured); jellied svid; hrutspungar (soured rams’ testicles); lundabaggar (loin bags of sausages made from the neck tissue or sirloin of the sheep wrapped in the colon and some suet and sewn up in the diaphragm). In addition, there are soured briskets, seal flippers, hard fish, unleavened flat bread, and butter. With the food and particularly with the shark, the tradition is to drink Icelandic schnapps called Black Death (Brennavin). So, whether the Þorrablót was named after the Norwegian king, Thorri, or after Thor, the Norse thunder god, it is a fun and interesting tradition. We are happy to celebrate it here in North Dakota. 2011 – Sunna Pam and Jeff Furstenau held a Þorrablót at their house with the intention of having a community Þorrablót the following year. The new Mountain Community Center was slated to open late in 2011. The event was very fun with about 18 people attending. 2012 – The next year, the center was not ready, so they again hosted at their farm and about 25 people attended. 2013 – The 1st Mountain Þorrablót was scheduled but without enough volunteers, the idea was put on hold. 2015 – Þorrablót #2 by the ICA was another sold-out success. Jolene Halldorson and Kathie Johnson chaired the event. We again had lots of great volunteers, donations, entertainment, baking days, food from Iceland donated by Jóhann Kristján Ragnarsson and Guðný Þorleifsdóttir, friends of Sunna. Dennis Biliske once again was the Live Auctioneer. This party is so much fun. 2016 – Þorrablót #3 by the ICA was another sold-out success. Jolene Halldorson and Kathie Johnson chaired the event. We again had lots of great volunteers, donations, entertainment, baking days, food from Iceland donated by Jóhann Kristján Ragnarsson and Guðný Þorleifsdóttir who visited us as part of the “Cousins Across the Ocean” project. Thanks again to Hall of Fame auctioneer, Dennis Biliske and crew, for a fun and successful auction!